(FOR CLINICAL REFERENCE LABORATORY) It is always our endeavor to continuously improve the quality of services we provide. Kindly spare a few minutes of your precious time to fill this form. Your feedback is very important to us and will help us serve you better. Please tick ( ) the most appropriate option as per your opinion. 9. Would you continue to utilize using rgtdrty VIMTA services in future? VIMTA through its Clinical Reference Laboratory (CRL) provides service to millions of people in India. Stringent quality systems, equipment, state of the art, world class infrastructure backed by a proficient team of expert professionals are the core strengths of VIMTA CRL. The laboratory is designed to handle large volumes of samples efficiently and effectively, permitting delivery of high quality, rapid services maintaining highest of customer satisfaction levels. 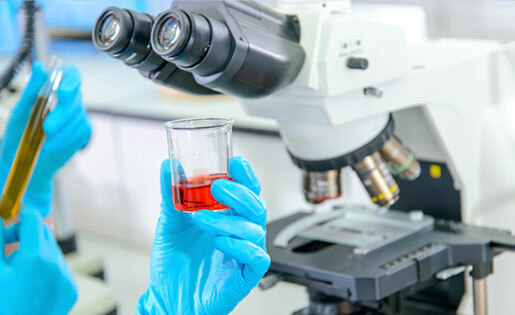 Different range of laboratory tests are conducted covering various fields viz., Molecular biology, Microbiology, Serology, Enzyme Immunoassay, Immunology, Biochemistry, Hematology, Clinical Pathology, Flow cytometry, Nephelometry, Radio Immunoassay, Neo-natal Screening, Cytogenetics, Histopathology, Cytology and Immuno- Histochemistry. All laboratory tests are conducted under strict supervision and quality control. Responding to the demands of reach and time, VIMTA has implemented Laboratory Information Management System (LIMS) with interface to test equipment's for enhancing productivity and quality of laboratory work, and web integrated its reporting system to provide instant access to results to its customers. This initiative makes VIMTA the only laboratory in India on par with leading laboratories across the globe that offers complete on-line services. Quality Reports with timely, quality laboratory testing and services that help provide improved and dedicated patient health care is VIMTA's primary policy. Our Customers include patients, physicians, business associates, hospitals, and pharmaceutical and biotechnology companies. Accompanied by VIMTA's commitment is the expertise in the fields of Biochemistry, Hematology, Serology, Molecular Biology, Microlbiology, Histopathology and Cytogenetics, services ranging from determining Rh type to Genetic counselling. In addition are provided new launch of laboratory tests by development , validation and verification. Human pathology has been one of the keystones to medicine and rightly so at VIMTA. Pathology and Laboratory Medicine provide state-of-the-art diagnostic and testing services. Listed below are the various Departments of VIMTA CRL(Clinical Reference Laboratory) and the various services and techniques, they provide. Microscopy : Direct microscopic examinations offered for samples reveal gross pathology. Gram stain, AFB stain, KOH mount, India ink stain offered , giving the treating clinician an idea on suspected organism. Increased sensitivity, lag / log phases, antibodies dilution & rapid detection. Drug susceptibility Testing : M. tuberculosis complex isolates are tested for sensitivity to first-line and second-line drugs with MGIT instrument. Assays performed under strict quality controlled environment, using well defined methods and reagents. VIMTA shall ensure that all personnel involved in the quality of operations familiarize with the policies and procedures of the management system and implement the same in their work. VIMTA is committed to providing reliable patient results by combining processes, that promote efficiency, with technology that is appropriate to meet laboratory goals, and operated by staff who are trained and competent. VIMTA shall strive to ensure customer satisfaction by maintaining independence, impartiality and integrity in its operations, and improving its management system continuously. VIMTA is accredited by National Accreditation Board for Testing and Calibration Laboratories (NABL), an autonomous body under the aegis of Department of Science and Technology, Government of India since 2003. VIMTA has successfully faced the audit in accordance with ISO 15189:2012 standard requirements and accreditation granted by NABL as per 15189:2012. The test results and measurement data produced by Indian accredited laboratories are acceptable amongst 64 economies. NABL accredited laboratories have therefore emerged members of global family of more than 40,000 accredited laboratories.